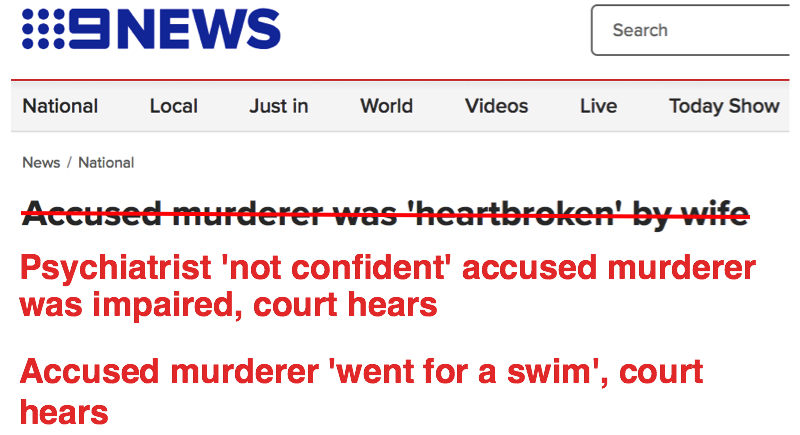 FixedIt: what evidence makes a headline? Channel 9 News published an AAP report on the progress of Warren Francis Rogers’s trial for murdering his wife, Anne Rogers. The same report was published by Channel 7, The Newcastle Herald, Campaspe News, South Riverina News, among others. All of them carried the same headlines, presumably sourced from AAP. I wrote about this trial last week, and the risk of fixing the appalling headlines coming out about a trial still underway in the court. That risk still exists and any headline that states he is guilty before the court has reached a verdict is dangerous and irresponsible. As is any headline creating sympathy for the accused. This one is slightly different to the ones I was talking about last week, in that it is using a quote from the evidence presented to the court as the basis of a headline. Dr Martin gave evidence on a number of things Warren Rogers told him about his wife and their relationship. He also stated his opinion on Warren Roger’s state of mind. “Dr Martin said he is ‘not confident’ the accused was suffering from a major depressive disorder at the time. ‘My view is that the actions were deliberate and purposeful, he said. ‘I don’t think there’s much evidence to say that he completely lost control. It’s not just fair for court reporters to relate all the evidence presented to the court, it is in fact their job. So there is no issue in them describing Dr Martin’s evidence about Warren Rogers saying he was “heartbroken”. It is interesting, however, that they chose this word for the headline. “Heartbroken by wife”. This is how they headline evidence given about a man accused of murdering his wife. Why choose this quote rather than anything else Dr Martin said in court? Any of his evidence, as long as the quote was accurate and was clearly marked as a quote, would be reasonable to use in a headline. Dr Martin also told the court Warren Rogers went for a swim, talked to his daughter, and allegedly admitted to killing his wife but said it was not premeditated. He also stated he believed the accused’s “actions were deliberate and purposeful”. Channel 9 could have chosen any of these pieces of evidence for a headline. Instead they chose to implicitly blame a murdered woman for leaving her husband “heartbroken” and did not make it clear this was a claim made by the man accused of killing her. any interviews with witnesses or potential witnesses. This headline is clearly creating sympathy for the accused. Whether is it a “fair and accurate account of court proceedings” is far less clear. But it would be interesting to know what a court would make of it.